This one is a bit bittersweet. Yesterday, I woke up after a lie in, still nursing a cold with a sore throat and very little voice. However, I had ticket to see the English National Ballet perform the Nutcracker in London for the afternoon and with no school for a fortnight, things were looking good. And to cap it all, it started to snow! I was totally jazzed. But then it kept snowing and we had three or four inches and the airports closed, traffic came to a standstill and tube lines were dropping like flies and it was looking less and less likely that I'd be able to get to the ballet. I did set out to have a go at making it, but after being outside for 30 seconds, I was completely coated in snow and after a minute, it was trickling inside my scarf. After a few minutes of indecision when I trekked back and forth towards the tube station and back, and forwards and back, I gave it up as a bad job and kissed goodbye to my ticket. It turns out I would probably have been late anyway due to delays on the line. I was really looking forward to going - have been for a month and I was looking forward to the chance to do something really Christmassy and wonderful to celebrate the end of term. I've not seen the Nutcracker before. So after a sympathy phone call home, I settled down on my sofa to look out of my window and watch the world turn out, the people coming and going, children wrapped up spherically, the odd snowball... And standing at the window, I could see people in windows across the way, standing in their flats looking at the snow. And it felt nice to be all cosy inside, knowing I don't have to do anything and being able to share the lovely weather with people up and down the country as we all hope for a white Christmas. And there's still lots to look forward to. My family are coming down tomorrow (I'm waving at you family!) and we've got lots of wonderful things planned, I'm going to the cinema this afternoon, I'm going home to Yorkshire in a few days, and I can always go the ballet next year. Weather permitting. So here's my page from my window. P.S.The sassafras embellishments - entwined blooms - and paper are so beautiful - it's a lovely colour palette and I shall look out for more of them. P.P.S. Another thing to look forward to is getting a new paper paper trimmer. I dropped mine and it broke about a month ago so all these JYC pages are being made without proper straight-line-cutting abilities. I have to wedge some of the pieces together and hope they hold long enough for me to cut a line. Often they don't! And, warping backwards through time, I come to my Christmas carols page! This is a picture of my grandma and I at a service where carols were definitely a feature! My family and I all love to sing perhaps more than is strictly necessary, especially if it means we can put in alto, tenor and bass parts and a descant over the top (yours truly). When we don't know them, we make them up. Same goes for the words. Fortunately, we know the carols pretty well and there's no need to ad lib. Much. School finished today. It was nice - it even snowed! - and I got some fab presents from the kids but I was totally glad to end the year as I still feel pretty rubbish. Hope that everyone is also looking forward to some lovely, relaxing holiday time! P.S. When you're ill, the sensible thing to do is stay in and rest. So I went to see The Voyage of the Dawn Treader with a friend which was definitely more fun! Plus I got to keep the 3D specs. This is only cool if you happen to be a member of my form. Which, if you're reading this, I sincerely hope you aren't. You should be...doing your homework? Housewarming pics! Scrapped a few of the portraits and documented a few giggles - nice stuff to remember. I know this doesn't seem Christmassy but hey, there are decorations in the photos and I had to tidy up the flat for company so never mind. Mix and Mend love! Still ill which is annoying as it was the carol service this evening and my throat seriously impaired my singing. Still, went out for Japanese food with colleague beforehand so yum! I've also been chain swallowing throat sweets - I NEED my voice to teach (except in my silent mime lessons but that's a story for another time - and so I've been eating Nin Jioms all day. Given to me by aforementioned colleague. They are lemon and herbs flavour. The box is unspecific about the herbs. I accidently started a small drugs ring in my form as we all swapped throat sweets and tried them out. Italian sugar free ones = yuck. Anyway, went to pick up two boxes from the post office yesterday and they cheered me up LOADS as they were both kits full of stash. And you know what? Both kits are absolutely brilliant. One was my first Scrapagogo design team kit and the other my Studio Calico. Only two more days of school and I can curl up with 18 cups of tea and my new deliciousness. Apologies for lack of coherency. P.S. Carol service went very well, felt v. proud of students and love that we have 2 large choirs in a boys school. Singing rules! So do carols. So I'm a little behind on JYC - busy weekend! I had a housewarming with a few friends and we had a great time. We also went into London the next day. Obviously I took lots of photos! This page uses a few of those and I documented the fact that I do most of my Christmas shopping in October Half Term. That way, when December rolls round, I can enjoy the festive delights of London, the twinkly lights, the trees, the hot drinks and the bustle.... and I don't have to join any of the queues! Well, making a page based on one Christmas tradition is an impossible task. So my pick wasn't really a Christmas tradition so much as a December tradition - it's a little early still for the proper ones. Anyway, once the weather turns, out comes my red beret! I love wearing it out and about and it always feels more festive in December than at other times of the year. P.P.S. Really looking forward to a bit of weekend scrapping time. It's a bit (or a lot!) or a squash to make my page some days. Tomorrow it probably won't happen so look out for more come the weekend! Thankyou Hipstamatic for quick Christmas pics! And that's all I have to say tonight as busy! For my Christmas memory, I picked something that actually isn't technically from Christmas. 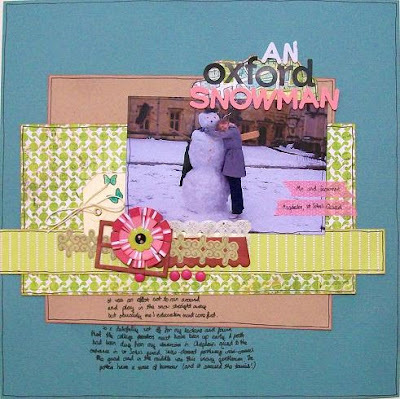 The photo is from a big snowfall we had in Oxford when I was a student. We woke up one morning and everything was covered. I did totter dutifully to my lectures in the morning but the rest of the day was spent blissfully playing in the snow. Oxford colleges have zillions of lawns and normally you're not allowed to go on them expect at very specific time. Like croquet season. But it seemed like normal college rules were suspended and we had a huge snowball fight (which got broken up by the bursar when one snowball went through is window - who has their windows open when it snows?) and slid down a big snow slide on one lawn and snowman sprang up all through the grounds. This one was in St John's quad, which is the one the tourists have to enter. It turned out the porters had gone out really early and built him from the snow they cleared from the paths. Where they found the mortar board and gown they weren't saying but he looked terribly academic, dont-you-know. And I think he was responsible for lots of the tourists that day as he was the first thing that they could see through the porters' lodge gate. Just need to add the date! I wanted to include this picture for my memory today, partly because I love it and partly because it makes a nice contrast with my page from the 2nd. Just not enough snow!!!! Had a fab evening having fish and chips with the Guiders in the Hut. Sounds weird I know, but it was so lovely. A story for another time! P.S. Got my Christmas Radio Times. Massive fun to be had with a long sit down, a cuppa and a biro for circling the all-important Christmas vegging out time. Now all I need is the time. Big Christmas tradition and makes up for all the telly I don't get to see during the year! P.P.S. School concert tomorrow so might be a little while before that page happens. I don't have an advent calendar this year. Note to self, make one for next time. I am however, doing a Countdown to Christmas with my church from back home, where each day you get something to think and pray about and also donate a little bit of money as a way of counting your blessings. I think this is a lovely idea although expensive as on the 1st, you had to donate 10p for every cookbook you own. And I suppose as I light candles each night during advent, and do JYC, I am counting down in my own way. So I journalled about getting advent calendars from Nanny when I was younger. They always had Christian themes - you'd get a picture from the Nativity story and a Bible verse that would unroll as the days passed. But she also used to give me a packet of milky way Magic Stars so that I wouldn't miss out on having a chocolate each morning! I really think she was onto a winner there as a packet of Magic Stars often had 30+ stars which meant you got loads of extras as opposed to the measly 25 in commercial calendars! I've been playing with photography for this picture and also acrylic painted the edge of my page. Instant snow effect! P.S. This brings me up to date with JYC. Loving this project! A bit behind as I popped to Oxford for the weekend, but after a lovely Sunday afternoon scrapping with Lou, a fellow JYC-er, I've caught up both of this weekend's pages. Yay! So what's my perfect Christmas? Well, I don't require anything other than my family and being at home. That is was makes Christmas for me. Anything else just wouldn't be right. I'm happy to consign designer Christmases to festive films and glossy magazines. They might be pretty, but they're not Christmas to me. So here they are, my family Christmas. P.S. Yes, I am doing 12x12. I found I didn't have enough space to journal last year. Small pages take me just as long as big ones as it takes ages for me to decide what fits on. For me, it's easier just to go bigger and not worry. P.P.S. Made the flower using a technique learned from one of the ScrapaGoGo team in a fab class. Yay! Well, I mentioned the Rocky Road went down a storm! I started off with Nigella's recipe but substituted ginger biscuits and added nutmeg, cinnamon, a little vanilla and some sugar stars. To make it Christmassy! I will be making it again before long for the simple reason that I am terrible at Christmas cards but I love baking so I usually give edible Christmas cards. I bake a batch of something, make it more festive and hand them out with Seasonal Greetings! The staff (and even the odd curious sixth former) made short work of these. The next batch will be for friends. So why don't I give cards? Well I do give some in a conventional way. I always buy a box - they must be Christian in message and from a charity - but I dislike how impersonal they are. Everyone gets the same card. But I don't enjoy making cards like I do pages. If I bake, I still get to make something, it's still personal and hand-delivered and it's also delicious! P.S. I told you I'd bring back the stitched circles. Although this time I drew them on! Well the weather outside is merely frightful ish. Some places have had bucketloads of snow and we have had doodle squat. It barely even covers the ground. I took a picture of some out of the maths office window (Hipstamatic - eep!) to prove that we'd had some but mainly I'm jealous of the proper snow others have had. I quite fancy a day off! Anyway, the boys are convinced that there's far too much snow to be in school. This is because they are wussy and from London so they don't know that 2cm doth a real snowfall constitute. 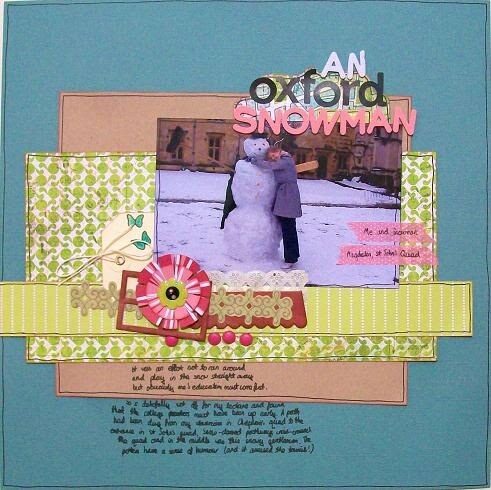 On the bright side, I got to use the lovely Jillibean Soup snowy paper that I've been saving for ages, specially! P.S. The rocky road worked fantastically and went down really well. Will add it to the "make frequently" list. P.P.S. Guess who's one of the new members of the Scrapagogo design team! Check it out! Well, it's finally here! December, all things Christmas and JYC! And Classic fm played their first carol this morning. Lovely! In the Bleak Midwinter. I'm going to focus on journalling this year, particularly as that's what frustrated me last year. Oh, and better photos. I'm pleased with this one documenting the things I like to don to keep cosy while I look out at the Earth quietly freezing. However, to get the photo involved me propping up the camera and using my boots as props to accurately focus, then pressing the self timer, performing a death defying leap over said camera, flinging the boots out the way and making sure I stand in the right place and then smoothing the wrinkles out of the socks. Click! Looking forward to looking at other JYCs - so exciting! P.S. I made these socks one summer in uni. They're really long and I was mocked mercilessly by my fellow employees. They have to be worn with a suspender belt to hold them. That casued comment too. I love St Pancras station. It really is one of my favourite places in London. The architecture is beautiful and it's a great place to watch the world go be. In short, it is romantic: everything a station ought to be. In fact, whenever I catch a train for there, I always make sure I have plenty of time so spend in the station first. And I discovered I am not the only one to do this. The lure of the station is also felt by my friends who confess to doing the same thing. And we all agree that one of the best bits is choosing your tea and cake to go from Peyton and Byrne so you have something to indulge in on the train. Yummy! P.S. Glad you liked the snowflakes! I'll work on the tutorial and get it posted! And of course, that must mean decorations. I'm going to make my own this year as I think this will be just as festive and much cheaper. Plus I'm using up old (and we're talking about 5 years old) stash. I thought blue snowflakes would be appropriate and here they are! I'm pretty chuffed with how these turned out. I saw similar snowflakes in a shop window last year and thought they were very pretty and delicate. So when I got home, I attempted to make one. I used scrap paper and it turned out to be huge and unwieldy and time consuming. Largely due to the fact that I couldn't lay my hands on any glue so I thought stapling would be a good idea. Also, the paper had no structural integrity. This meant that although my parents hung it up, (and for some reason, have not taken it down), it started to droop and mis-shape pretty quickly. I have learned from my errors. I made them smaller with glue and a newly-designed middle has meant that these specimens are holding up rather well. I was really pleased and made three while watching It's A Wonderful Life and another while watching Kirstie's Homemade Home. I no realise the downside - I have nothing to hang them from. So this year's challenge will involve large amounts of blue tack, cotton and my beautiful freshly painted ceiling. Wish me luck! P.S. Thoughts on these? I'm thinking about doing a tutorial. Anyone else making decorations that I can mercilessly pillage? Yay! Studio Calico kit came! And it was filled with yummy map-style paper from Basic Grey and a lush paper called Peleton with bikes on by the Studio themselves. Something about them said Paris to me so I put them together with this pic of my friends posing on a bridge over the Seine and included a few of our Metro tickets. We did have a great time seeing all sorts of different things but I think we were all agreed that where we really struck gold was with the eating places which were non-touristy and gave us the chance to practise our French and see the locals. Chez Louisette was a cafe that served us a delicious lunch while being serenaded with traditional Chansons. Audience participation encouraged, although you must put something in the hat each time the performer passes it round. There was also some great people watching as matriarchal French women served food and henpecked the harried-looking waiter, Gerrard. Poor bloke. In the evening, we went to a crowded bistro called Le Tambour where all the staff seemed to be male with grizzled haid, moustaches and aprons from which they could pull a bottle of wine at a moment's notice. They were all extremely genial and while I scored points by asking for Gratinee d'Oignon, I was mocked for ordering tea. My friend Ruth whose French is pretty awesome even managed French banter and as we left, our waiter said that next time we could return as friends. Kisses all round. I've been having a weekend in as it will be the only one I get for weeks so it's been great to have some quality scrapping time. Got a few projects in the pipeline - watch this space - and I've been watching Merlin. I've never watched this on telly but I got the first disc with LoveFilm this weekend and it's great fun! How excited is everyone about Christmas? Lots. P.S. Collecting yummies for JYC. I'm trying not to buy anything new and really enjoying digging through stash and matching stuff up. P.P.S. Have to wait until Thursday to see Harry Potter. My students have been warned that spoilers = detention. This was the title of a class that I took on the Scrapagogo getaway. Great class as there were loads of photography themed supplies that I would never have bought myself but that I really enjoyed using. Including some film strip - score! I made the page about my Diana lomography camera. Snagged a free camera stamp in the kit as well. Excellent! Feel I need another holiday now - was there ever a half term? Looking forward to Christmas hugely. It's my favourite time of year and this weekend I'm going to hibernate totally in my flat with Christmas films and music, do some baking, some crafting, some flat-tidying and decorating and just enjoy some me-time. Before all the seasonal craziness begins! I also have a cold at the moment so I'm going to see out this episode of Poirot and retire to bed with a scrappy podcast. If you've never listened to the Paperclipping Roundtable, I suggest you give it a go. A few scrappers chat about various things in the industry and there are some good ideas. But mainly, I find it really relaxing to listen to people chatter while I drift into sleep - a bit like listening to a conversation on the train or in a cafe. P.S. Waiting for my November Studio Calico kit now - need a stash injection. P.P.P.S. Clearly it's accident week this week as my iPod has finally given up the ghost, the power cable for my laptop is on the out and I dropped a book in the bath. Let's just say it has more dimension now. On the up, I am examining the budget in detail to see if I can afford an iPod touch because they are too cool for words. Well, our 26 hour dash to Paris was lovely - we all felt like we'd been on a long holiday and although we came back very tired with sore feet, we had an amazing time! We were so excited even on the train home, discussing where we could go on our next trip! I took my lovely camera and my favourite 50mm f/1.8 lens which I love and I've got loads of pictures. 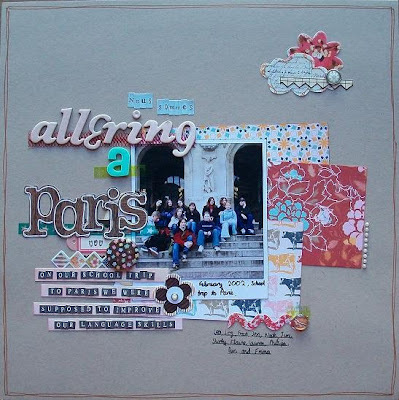 Stories from Paris as I make pages! Suffice to say I've come back with lots of images to play with! And I was so pleased that my two fabulous friends came with me - one had even figured out the entire Paris transport system which meant that we didn't have to spend time wondering where we were - we could just grab a bus and go! Oh, and we went to a couple of AMAZING bistros and practised our French, made some friends and gorged on Tarte Tatin and Profiteroles! P.S. On a less successful note, we missed our Eurostar home. Alarm fail! So the trip wasn't quite as cheap as I planned. So we decided that this will be a trial run and we have learned not to do this next time. Streets of London is a page I made using the index card from the film I had printed. I shot it on a wander around London with a friend and although some of the photos are a bit blurry to use full size, you can't really tell that on a teeny tiny index print! I arranged them all in order and used the journalling to tell the story of the afternoon: a stroll from Leicester Square down to the Thames, along to the Tate to see all the sunflower seeds, and back up to Soho for tea! Plus, got my hands on some of the new Cosmo Cricket Circa 1934 which is right up my alley as it's all muted vintage tones and it's GORGEOUS. Yummy. And the winner of the giveaway was Abi! Yay! If you send me an address to kirsty [dot] merran [at] googlemail [dot] com Abi I can get that in the post for you. Right, off to Paris tomorrow for a weekend - hurrah! Have packed no clothes and 3 cameras which means my priorities are in order. Back on Sunday morning but we'll have a whole day in the city and we'll see what we can fit in. Am obviously taking my beret for posing opportunities. And it's given heavy rain. Excellent! P.S. Harry Potter on the news today. Looking forward to seeing the new film. My form invited me to go with them as long as I didn't come to their sleepover afterwards because they thought that might cross that line. I declined politely. P.P.S. So excited to win the measuring cups - have recipes lined up awaiting! Really love this photo. It's not very good at all but it was one of those that really has some great stuff going on in it. I lined up the family for a group portrait at my brother's 21st and took a few shots. They were nice but a bit..well...staid. Everyone stood up straight and smiled nicely and that was that. After I'd taken a few, they said why didn't I get in one? Several reasons: do I trust my family with my camera? Emphatic no. Did I have my tripod handy so I could self-time? Unfortunate no. Even if I did trust someone enough to hold my pretty pretty camera, would I want them to miss out on being in the picture? No. Now I actually like having my picture taken. I'm a terribly vain show-off and don't really mind having bad pictures of me floating about. I figure if I'm in enough of them, some have to turn out well and those are the ones that I can scrap! So I pulled and arms-length picture, stood in front of the camera and attempted to angle it so the family would be around the outside. Result! Sort of. But you know what? The smiles and grins and giggles on the faces in the background are the best, the most natural and the most lovely of any of the group shots. Going to scrap a bit now in order to suppress the trials of teaching Income Tax to an inquisitive Year 9 group. Inquisitive, and enterprising. Student: Miss, if I set up a charity for my hamster and get it registered and then I give my hamster £10 can I claim the gift aid back to make more money? Me: Enterprising, but no. You aren't a UK taxpayer. Student: What if I get my parents to make a donation? Can I claim gift aid on that? Student:I'm going to do it and make loads of money. Me: But you can't just spend it - it would be the charity's money and if you spend it on computer games, that would be fraud. Probably. Student: Aha! But! I'm going to spend it on hamster food. P.S. The spirograph flower is a Sassafras Paper Whimsy. Love them! Another couple of "old" photos. OK, they're not really vintage, but they are to me. 1998 is like, so last century. Which is what I find so inspiring! I got a bit tired of scrapping my modern pictures - much as I love scrapping my doings in London, it's nice to have a variety and my box of old photos is still providing this by the bucketload. These ones feature my brother and I befriending a sheep. In Wales. It was surprisingly willing to be manhandled and pose for pictures but I remember having to get down on hands an knees so we'd be on the same level! And since I adore vintage-themed supplies at the moment, they seem to complement older photos rather well. I'm not as interested in the ephemera - you know the old cards and pictures and bits and bobs that companies now reproduce - but I love the muted tones, the off-white, lettering styles and, yes, still having a kraft phase. Actually, most of what's on here is just scraps sculling about on the table. My poor kitchen table hasn't seen food for days. I can eat on my lap and leave my stash out instead! Although I did accidently get some StazOn on it today. Ooops. P.S. My students are teaching me to speak street so that I can take my Gangsta (note the spelling) GCSE. They do not rate my chances. They call each other Sherlock a lot at the mo - assuming this was a reference to Mr Holmes, I enquired if they had read any of the stories. Blank looks. Gangsta faux-pas number one. Gangsta faux-pas number 2 was referring to number one as a "faux-pas". That's bear dread, man. P.P.P.S. I did however get them to admit that I was the most gangsta member of the maths department. Unfortunately, this is the equivalent of being the best at embroidery among goldfish. Doesn't say much. We're not a naturally gangsta bunch. P.P.P.S. Feel my gangsta vocabulary would make a good page for the True Stories class. Definitions! Note to self. All the crisp, beautiful autumness seems to have dissolved under a damp layer of drizzle so I thought I cheerful leafy photo might help to stand in the way of this. First I want to say huge thank you's to everyone who took part in the blog hop. I loved reading your blogs and finding loads of inspiration and new crafters. I've added loads to my reader and shall never, ever do any work again except as a cover for my illicit blog-absorbing. And thanks for all your comments! It was lovely to hear from you all! This is one of the pages I made on the getaway - the vintage feel supplies (lots of October Afternoon Thrift Shop, one of my favourite lines!) was great and we used old dress making patterns to make flowers. Sadly I cannot crochet so I didn't make the flower, but I often shy away from larger embellishments like this so it was brilliant to use some. Plus, lace. Plus vintage dress-maker pins. Need I say more? No? Busy weekend - hardly got any scrapping done. Did make a curtain for my bedroom though, went to see The Railway Children at Waterloo station (very cool, stage was the old Eurostar Platform, seats banked up on both sides, real steam train from Yorkshire), had French toast in a diner, watched a couple of films, and mooched around Camden market. Very productive actually as found loads of potential things for the flat and picked up a vintage printer tray for £8! Excitement! I'm going to try altering it and hanging it on the wall. Actually I'd like to de-Ikea my flat a bit, by which I mean make it look a bit less, well, flat packed and identikit. Don't get me wrong, I love the stuff I got, but I'd like smaller things to make it seem more cosy and homely. Anyone got any suggestions of ideas? Or any good blogs? I'll carry on watching Kirstie too. Oh, and it has to cost next to nothing as my budget feels a bit as though I bludgeoned it with a whole frozen tuna. Or similar. P.S. Louisa-Jane, I think I am totally thinking what you are thinking! Unfortunately, I can't view your profile or anything, so if you are still thinking email me! kirsty[dot]merran[at]googlemail[dot]com. Welcome one and all! Tonight's post is part of a blog hop which you can start on Lizzie's Blog. Organised by Jo and Lizzie, we are all celebrating the wonderful things that blogging can bring. If you're not hopping, why not try it? If you visit all the blogs, you can collect letters to make a phrase and win a prize! I have something of a confession to make. I'm a bit shy. I haven't been blogging all that long, and it's only recently that I've been blogging regularly. And because of these things, it's difficult to talk about blog friendships. So first of all, let me say, I'm keen to make some new ones! Blogging to me means crafty inspiration and so I'm relishing to chance to discover some new blogs and admiring some familiar ones! What I love about crafty blogs though, is the genuine warmth that the people behind them have for their work and for each other. Everyone I've come across has been lovely and encouraging and I love that strangers are willing to take time to say to each other: what you've made is beautiful. I love the inspiration I get from blogs which is why I've decided to share this page. 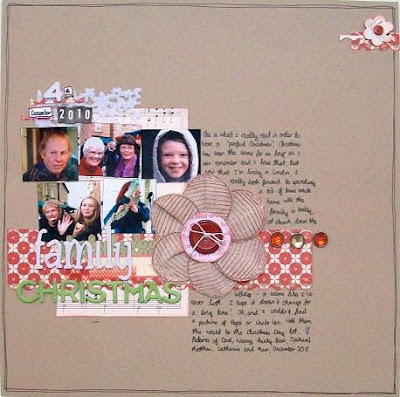 There are so many things in my scrapbook page that wouldn't be there were it not for the blogs that I follow. The photostrip idea, the Mix and Mend paper, layering and banners, tiny type and mixing letters for titles....all things I've picked up over time. So thanks for the inspiration, one and all. I'm really looking forward to shamelessly pillaging your blogs for ideas and hopefully making a few friends on the way! Finally, I'd like to celebrate by having a little giveaway. I've had a bit of a clearout and I have a stack of 40 unloved 12x12 papers that need a new home. I'm not a card maker so there aren't a huge number of ways for me to use them up. There's a big mixture of styles and colours including quite a bit of some old Basic Grey lines. Leave a comment by 12 noon GMT on Tuesday 9th November telling me that you'd like to offer it a home and I'll randomly draw a winner! I really hope that someone would like to make use of it! And now it's time to Enjoy the Ride Today by hopping along to the next blog! P.S. The magic letter? It's R. Good luck! I made this page in one of the classes on the Getaway - it was one of my favourites! There was pattered paper with cute little houses on it and wood veneer and chip board - what's not to love! I went with pictures of a friend and I putting up our tents at Hay-on-Wye Lit Fest. It was so cheap to camp and in the evening we made friends with a group of fellow campers who'd had the forethought to bring marshmallows and then lit a fire under them. Yummy! I made this from October Afternoon text paper (Lush!) and Sassafras bits and bobs and it features my two little cousins (not so little any more) playing pullalongs. Pullalongs is a self-explanatory game involving vehicles on a string, walking around the garden, and roping in as many people to do it with you as possible. Made during cropping time on the Getaway - I want to go again! Right, huge to-do list calls. Life first, scrapping second I suppose. For true stories, we were asked to write a letter. I wrote home. Sort of. I wrote a letter to my Mum and Grandma, thanking them for writing to me each week. I love that they both take the time every weekend to think of me and share all the news from home. They live next door to each other so it always makes me chuckle to get two perspectives on the same events: the church service that week, what the council did with the roof insulation, how the veg patch is getting on. My Mum is very much her mother's daughter, as I am my Mum's. We all three are very much alike and watching them is like beholding my future. Fortunately I admire them both hugely and would love to turn out like them. Fingers crossed. Getting their letters every Tuesday is one of the highlights of my day. And I'm not sure they know what their letters mean to me. What's strange is that often they will apologise for only having humdrum things to report. Little do they know that it's the everyday that I love, that makes me feel connected to home, which can sometimes feel like a long way away. This is the only photo I have of me with both my grandparents. It's the only one I will ever have. My grandma dies earlier this year aged 98. My grandad died over 15 years ago. I have strong and recent memories of my Grandma and I'll be able to make pages about her, but I was only little when they were both around and so my recollections are a bit jumbled. But some things really stand out. I remember visiting their house with my brother and playing: we were lucky to live within walking distance. My grandma cooked a lot. I remember Yorkshire puddings; little ones that I could dip in ketchup and brown sauce. I remember white cake and chocolate cake and chocolate dipped shortbread- that was really good. The kitchen was her domain. It was with Grandad that we really played silly games. He would sit with us while we all took it in turns to make up a story. And there was a song with 2 made-up words repeated over and over that he used to sing. Those are the things I remember and the things that I wrote on this page. This was one of the classes I took at the Getaway. This page is probably the one I am least pleased with from the weekend. I kind of wish I hadn't put the brads on. But the class was about making and embossing pennants which was cool and a technique I can bring into my scrapping. I guess that because I love these pictures, I wish I loved the page. The pictures show me painstakingly arguing, convincing and cajoling my family into having a group photo at my brother's 21st. We aren't often all together so much and I was determined to take the opportunity. Once they were all posed, it was "Everybody say... CANDID"
P.S. So I didn't post the letter after all. Will do it tomorrow! P.P.S. Also, nearly JYC! Whoop! Well I had the MOST FABULOUS weekend. I went on the GoGo Getaway run by Scrapagogo and I went on a whim at the last minute. I wondered if it would be worth the price, if the other scrappers would be nice, if I'd like the classes and so on. Well, it was more than worth it, the other scrappers were lovely and the classes were brilliant. AND I got to stay in a swishy hotel with tons of free food, which is always a plus in my book. Hash browns and white chocolate buttons for breakfast anyone? I'll have double helpings. So I've got loads of pages to share. The page above was a challenge for the weekend. On the first night, we had a group photo and then the next morning, we were all given a hybrid printed page and a copy of the photo to complete a page. I'm not really a hybrid girl - I want texture and cutting and sticking so I hacked my page apart and used elements with the same colour scheme. But I'm pleased with the result and I love that the challenge left us all with a memento of the weekend. P.P.S. Next time, I'll post my letter page for True Stories. Tea and gossip: two things I love to catch up on during half term. I took one of my friends to YumChaa. my favourite place to have tea in London and we spent a few hours catching up and chain caffeining. I love that they serve leaf tea in pots and they have a milk jug full of each different kind on the counter that you can sniff to decide which blend you'd like. I love that you get a teapot and a strainer which fit into their own cup. I love the shabby-chic decor: mismatched wooden chairs and tired, worn, comfortable leather armchairs. Most of all, I love that you can sit and gossip for ages without being disturbed. I took this picture on my little Diana camera which gave it a lovely vintagey tint for a lovely vintagey place. I drink too much tea at the best of times but at least during term time, I'm limited by the fact that I'm not allowed to drink during lessons. At half term, there's nothing to stop me and my kettle hardly gets off the boil. Hence all the pages about tea! The bed arrived yesterday and is now assembled (at 1am with much appreciated help from friend) and gets ten out of ten for ease of assembly and rubbish out of ten for clarity of instructions. Had a cup of tea and thought about it and decided not to do steps 2 and 3 as I didn't have the pieces anyway. Steps 1 and 4 seemed to suffice so I left it at that. So nice to have a bed! And I'm off on scrapbook retreat today! Time to pack! And then I can do a little scrapping before I go. But first, best put the kettle on. P.S. Wrote my letter yesterday for True Stories but haven't got round to scrapping it. Did manage to print off lots of new pics to scrap while watching Singin in the Rain though. P.P.S. Ah, Singin in the Rain. They just don't make them like that any more. I heart Gene Kelly and Danny Kaye. Wish I could tap dance. P.P.P.S. Thanks for all your comments - did a double take this morning! This a page based on a journalling prompt from Shimelle's True stories class. I decided to journal about maths, something I've never done before which is slightly weird as I'm a maths teacher, I did a maths degree and it's been quite a big part of my life, obviously. It just never occurred to me before and using numbers seemed like the perfect way to do this. 10: The highest power of 2 I know by heart. 153: The number of students I teach maths to. 11: My absolute FAVOURITE number. Rock on! 3: Number of years spent studying for my maths degree at Oxford. 22: Age I qualified as a maths teacher. 17: The age that I decided maths was for me. 2: The number of calculators in my school bag. 597: My mark out of 600 for A-level further maths. Score! Still playing with my Studio Calico kit. Still LOVING it. And while I scrapped, I caught up with past episodes of Downton Abbey. Great period drama, any other fans out there? And, big news: After over a month on the floor, my bed is being delivered today. In theory. They haven't called me yet, but surely they wouldn't lie to me? P.S. Big thanks for Carey for technical photo help. P.P.S. New ambition is to make cake pops. Geek is a title that I get stuck with. I like maths, Doctor Who, grammar, explaining how aperture affects depth of field, classical music and avoiding diminutive words whenever a multiplicity of lengthier specimens will suffice. Much to the annoyance of my students, whose sub-standard capacity for vocabulary needs enlarging in my opinion. Keeps them on their toes. Anyway, geek it is, and proud! I like to learn, it makes me happy! I like to know things and to find out things. I love Wikipedia and while I wish it was spelled Wikipaedia, I think it's brilliant that someone came up with the idea of letting the world stick together everything it knows, and some things it's made up. And all these things got me where I wanted to be in life, so what's so bad about that? Geek and proud! Today, I'm going to make my numbers page. P.S. Still having a kraft phase - I like how it's a little more mellow than cream or white. On the downside, now it's cloudy and miserable outside, I'm finding it harder to avoid this blue tinge on my pics of my pages. I don't use my proper camera to snap them, just my compact, to avoid huge file size and it's quicker. I think I should start and see if I can do something about the white balance because it's annoying! So I've been playing with the Sassafras Mix and Mend line that was in my Studio Calico box. 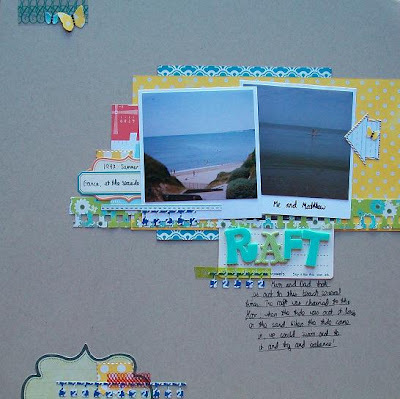 It's easy to work with partly because it all matches so you can hack up the papers and mix them, but there also loads of bits and bobs you can cut round so layering is easy peasy lemon squeezy. Lots of detail, minimal time. This page is kind of based on a page from Shimelle's True Stories class. It's only been two days and already I love this class. Journalling is really important to me and I never think I have enough space to write everything I want. I'd also like to loosen up my writing a little as I tend to get a little bit formal sometimes which is silly. I'd like to write on my pages like I talk or write here, more chatty and diary-esque so this is what I'm going to work on. Anyway, I loved this sketch as there was bucket loads of space of for scrawls. Fabadab. More like this please! P.S. I set up my broadband all by myself so I have proper speedy internet again which I LOVE and being a bit of a technocrap I feel quite proud of myself. I'm still really enjoying scrapping these old photos. This picture is of my brother and I standing at the edge of the sea waving and paddling. And wearing our matching fluorescent sun hats, obviously. Ah, 1995! It's nice to have a bit of time off after a hectic week. My form at school have collectively tipped over the edge so instead of doing PSHE we made origami dinosaurs using instructions from a birthday present a received; a book called Dinogami. As it turned out, origami dinosaurs are tricky and mine looked kind of like a dinosaur (or a pheasant or a frog apparently) and theirs looked nothing like dinosaurs. I blame the instructions, but on the plus side, it kept them all quiet for quite a long time. Relatively speaking. Had a lovely weekend so I'm making up for that today by getting my marking done and trying to put a dent in my Masters dissertation. A small dent will do. Then if I'm very good, I get to play with my new scrapping supplies! I received the American Crafts City Park line as a prize from Shimelle which was totally exciting as I had no idea what the prize would be. I love it and I'm going to scrap some gorgeous Londony pictures with them. Also my Studio Calico kit is absolutely delicious and it's great to get my hands on some Sassafras embellishments and Mix and Mend, some pretty tape, Studio Calico Papers and Jenni Bowlin butterflies. To name but a little!!!! P.S. Picking up my Diana+ film tomorrow. Eeek! Also, the Talk Talk guy is coming to put me in some proper internet so hopefully I can share them. P.P.S. And now I must stop procrastinating and actually do some work. P.P.P.S. It was lovely to hear how many of you were Guides - yay! These photos, once more from the box of old snaps, show my brother and I standing on a raft out to sea off the cost of France. We went to this beach several times and when the tide was down, this raft was chained to the floor with the most enormous grime encrusted chain, but when the tide came in, we could swim out to it and spend a huge amount of time attempting to scramble on top. Brilliant! Rafting like it's 1997. This week has been busy. I baked brownies for a couple of meetings I've had at school, we had Chinese take away in one of the maths rooms as we had to stay late for Year 11 Transition evening, and last night I took a load of Brownies and Guides to Trafalgar Square to celebrate the end of the Centenary year of Guiding. The event was packed and there was lots of music and dancing (of necessity as temperatures dropped!). Then at 20:10 pm on 20/10/2010 we all renewed our promise together and received a special commemorative promise badge to wear. It was lovely to be a part of it! Oh, and in a week, I will FINALLY be able to take delivery of my bed. Bring on half term! I'm kicking off tomorrow night with mac and cheese and film and friends night in. Perfect. P.S. Apparently two large packages are waiting to be picked up at the Post Office. I smell scrapping supplies! So much for improving our French. This is another pic or some of my friends from school with whom I went to Paris for a wet weekend in February. All this scrapping Paris has got me thinking how little I remember so I have spontaneously booked a weekend in Paris! I've roped in a couple of friends and we're going to hop across on the Eurostar very early Saturday morning, spend the day and a night rocking around the city and then slide back again Sunday morning. Slightly weird ticket times and a random hotel but a cheap deal as apparently not many people want to go to Paris for a weekend in November. 3 weeks in advance is totally spontaneous for me. Going to take no useful luggage and as much camera equipment as I can haul. People in glossy dramas or American sitcoms are always either popping away spontaneously for a weekend or wishing that they could. I can't believe it hasn't dawned on me before that I can! P.S. Shot a roll of Diana film around London. Will share some pics once I've had it processed. P.P.S. Oh Kraft, how I love thee! Still scrapping the old photos! This was back when I had a film camera which I saved up lots of Weetabix tokens to buy. I loved it because it used APS film and I could take three different picture sizes which was pretty high tech at the time. I went to Paris for a weekend with school (a long drive from Yorkshire!) and it rained pretty much the whole time. This did not particularly dampen my enthusiasm, but it does mean that all my pictures came back with this grey tint and cloud obscurity. I wasn't particularly impressed at the time, but now I quite like these pictures! Thinking of popping to Paris for a weekend with better camera and better skills. In November, I could enjoy and revel in the gloom. In the meantime, I will keep digging through my box of school pictures. Well, so much for being back into doing a page a day. It was extremely naive of me to think that that would be the case! However, these are the pages that I did do. I lack an album for them at the mo but one is on its way. I think 12x12 was definitely right for me as I'm not really into minibooks because I never feel I can fit enough on the page and I like to be able to keep all my pages together. Roll on Journal your Christmas I say! I am still not unpacked but thanks to the efforts of my parents this weekend, I now have a fully functioning wardrobe and chest of drawers, and several bookcases up including an Expedit for my scrapping stuff, amongst other things! Love Ikea! So tonight I shall be doing more unpacking. There's still so much to do; moving is definitely a longer process than I envisaged! I love, love, love having my own space though. I can't say this enough. Once I'm unpacked and settled, I can get back into scrapping, (I miss it!) but until then, it's going to have to be flat first. On the plus side, there will be lots to scrap about. Well, I think I'm almost in a place where I can do a page a day again. Which is annoying because we are somehow at the end of the class. When did September happen, exactly? However, I have furniture (not yet all assembled!) and the water is working (although a plumber is coming to move a pipe tomorrow so that my washing machine works) and maybe before the end of the year Homebase will take it upon themselves to deliver my fridge and bed! What I love though, is that I have built my sofa and coffee table and I can have a DVD, a cuppa, a biscuit, some candles and do some scrapping in this little oasis amid the chaos. So lesson one is make sure there is always a little oasis of calm! My other lesson is how brilliant my friends have been this last week, from helping me move my things to trying out millions of sofas in Ikea and then helping me transport the huge boxes, lending me tools and helping me get the stuff built! I have been really touched by how much time they've given up to undertake some frankly quite dull jobs. P.S. I just joined Studio Calico! I've been eyeing up their kits quite longingly for a while now so I took the plunge and joined! A nice house warming present to myself. Because after buying a property, the first thing you should do is spend more money. Well, I'm in! Now I need to buy some furniture so that I can unpack my stuff. The taps are now running with water, the washing machine has been delivered and plumbed in but it doesn't fit in the standardized washing machine space because some genius has run a pipe up the side of it. However, teething problems aside, and with a very tiring week behind me (and still no news on bed or fridge), this move has been worth it, and that's my lesson. It feels fantastic to be in my own space with my own things and do whatever I like. Although the walking around naked part will have to wait until I get some curtains. P.S. It feels good to scrap again! After scrapping every day for a couple of weeks, it felt really strange to have to go a few days without it!